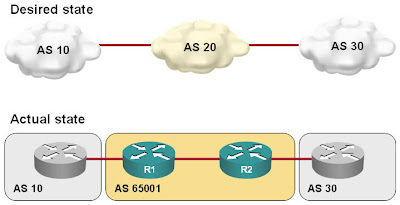 replace-as replaces router's own AS with local-as on outgoing EBGP updates. Hi Ivan little offtopic here, its looks like Cisco preparing 12.5T for this year. Few things already pointing for that like history of previous releases and bug tracker ;). So I assume 12.4(15)T will be last release with new functionality. Is there any way to do this if your IOS doesn't have dual AS support? I.e. is there any way to reproduce the "replace-as" functionality?